August 6, 2018 at 10:02p.m. 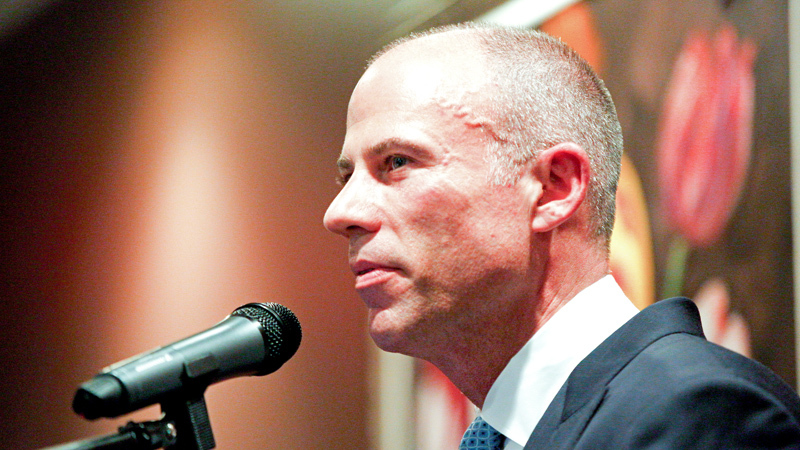 Photo by Emily Matthews | Nationally known lawyer Michael Avenatti, best known for representing adult film actress Stormy Daniels in litigation over an alleged affair in 2006 with President Donald Trump, was the keynote speaker Monday at the Mahoning County Democratic Party Chairman’s Dinner at the Upstairs Restaurant. Nationally known lawyer Michael Avenatti discussed during a Democratic fundraiser Monday night the president’s disregard for promises to bring back good-paying jobs to the Mahoning Valley. Avenatti, an attorney best known for representing adult film actress Stormy Daniels in litigation over an alleged affair in 2006 with President Donald Trump, was the keynote speaker at the Mahoning County Democratic Party Chairman’s Dinner at the Upstairs Restaurant. “Trump promised good-paying jobs to hard-working people and we haven’t seen that yet,” he said. “It’s a disgrace this president hasn’t even bothered to place a phone call to General Motors ... about the state of the Lordstown [GM] plant.” The plant, which produces the Chevrolet Cruze, is down to one shift from what had been three as car sales slump while buyers are choosing trucks and SUVs. It is critically important to meet people in the Youngstown area to hear what they have to say, Avenatti added. State Rep. Michele Lepore-Hagan of Youngstown, D-58th, said the truth is what interests her. Avenatti was the first college graduate of his family ­­— a middle class family in which his father lost his job during his childhood. But he fought his way to the top. And fight is what Avenatti intends to do. To achieve it, Mahoning County Commissioner Carol Rimedio-Righetti said it’s important to stand together. “We are a team that works to make it right for all of us,” she said. State Sen. Joe Schiavoni of Boardman, D-33rd, echoed Rimedio-Righetti’s sentiment on behalf of Richard Cordray, the Democratic gubernatorial candidate. “We all have to come together for the better good of this state,” he said. But not everybody felt positive about Avenatti’s presence or message. “If he’s [Avenatti] going to be the star of the party, that’s what we’re going to complain about,” added Ron’s brother Don Skowron, also of Youngstown. Signs protesting against the Democratic Party and Avenatti sat across the street from the dinner. “The Democrats started this when they put the duck up at the Lincoln Dinner turnabout, so this is fair play,” said Amber Waves of New York. August 6, 2018 8:20 p.m.
July 10, 2018 10:55 p.m.
July 11, 2018 12:09 a.m.
August 6, 2018 5:20 p.m.
July 19, 2018 12:10 a.m.